Do you have long work days? The slow cooker is a great appliance but food left in the slow cooker too long can get dried out and ends up tasteless. 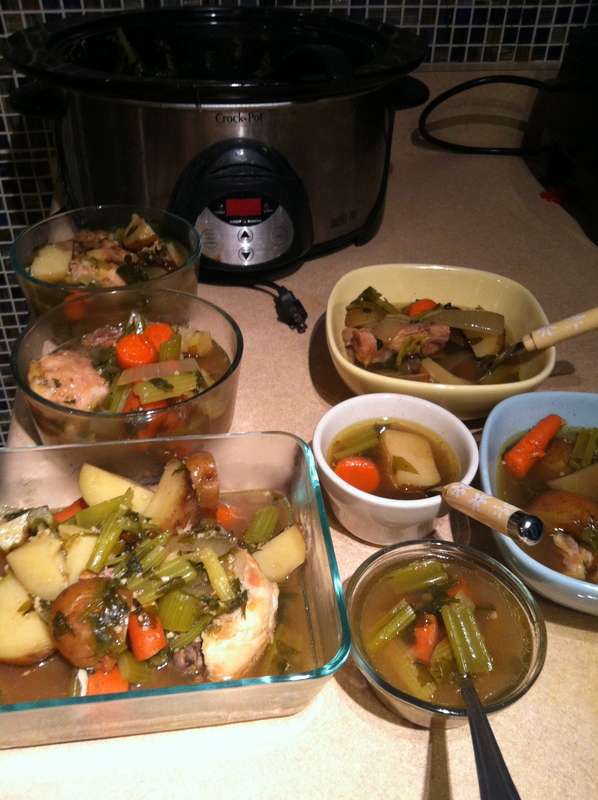 A client questioned whether or not you can use frozen poultry in the slow cooker and leave it for a long, long time. So I decided to try this out. Here are some tips for the slow cooker. Soups and stews can be cooked for a long time because they have a lot of liquid. Roasted or braised chicken or meat dishes can’t be left too long or they will get too dry and burn on the edges. Skinless poultry on the bone tastes better than boneless poultry. Pick a slow cooker that has a timer and a warm setting that allows you to stop cooking before you get home. Make food in bulk. Here’s what it looked like at our house when I made this soup. A couple bowls for dinner and then the rest into glass containers for lunch the next day and some more for the freezer. Defrost the chicken just enough so that you can break up the pieces and place in the slow cooker. Cube the potatoes, celery, carrots, and onion into bite size pieces and put in the slow cooker. Add more veggies if needed so that you’ve got a bunch in there. Mince the garlic and parsley and put in the slow cooker. Top with broth. Add enough to cover the veggies and chicken with 1-2 inches of liquid on top. Cook on low for 8 hours. It can remain on warm for hours; I left it for 10 hours total. Happy National Food Day 2012!